A$AP Rocky has expressed nothing but love for Raury as of late. Just several weeks after footage surfaced of Rocky bringing out his young tour mate to perform “LSD” in Sydney, MTV shared a video in which he called Raury a rare breed of artist. The short clip served as promo for tonight’s Woodies/10 for 16 event. The NYC rapper didn’t stop there, tipping his cap to Tyler, the Creator—who’s also in the video, sans pants and apparently (jokingly?) banned from Texas—for pulling off Camp Flog Gnaw. Watch the clip above, and check out Raury’s acoustic cover of Rocky’s “LSD” while you’re at it. 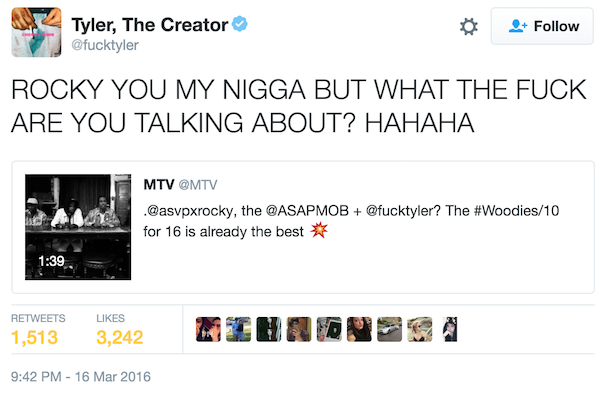 Tyler offered a response to his friend’s comments on Twitter—both glowing and comical.